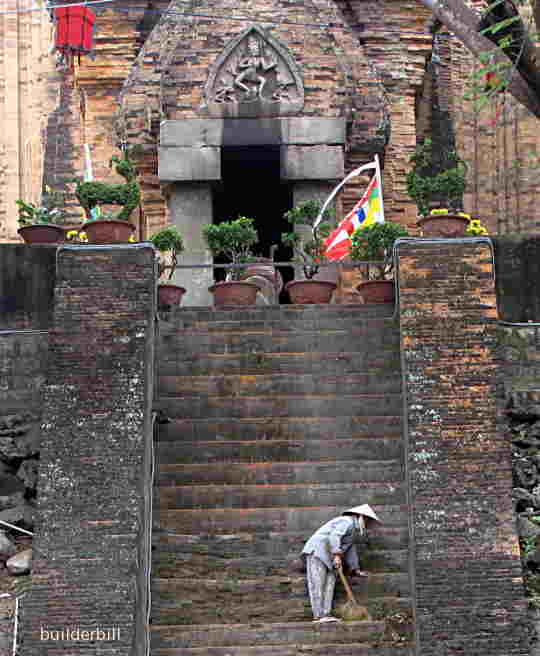 The old and atmospheric ancient relics of the Champa civilization in Vietnam. One of the things that I really enjoy about building this website are the interesting people I get into correspondence with from all over the world. Many of them become good friends and quite a few are fellow website builders. The other day I happened to ask one of my web friends Myra from Kudalini Yoga Info if she had ever seen any of the really old Hindu Sanskrit writing that she mentions on her site. I dug up this photo for her and looking at it again I still feel in awe of those ancient artists and craftsmen. 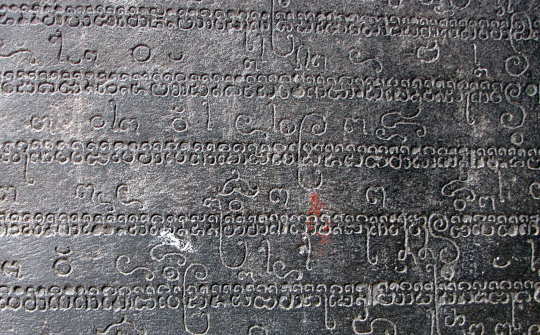 This and a few other examples that I have seen around SE.Asia would be the most beautiful writing that I have ever seen. Add to this the fact that it is not written with a pen but carved into the reveals (inside faces) of two large stone door jambs. The lines of script are about the width of a finger and cover an area of I'd say twelve square feet on each side of the door opening. Imagine making a spelling mistake! You wouldn't half be cranky eh? 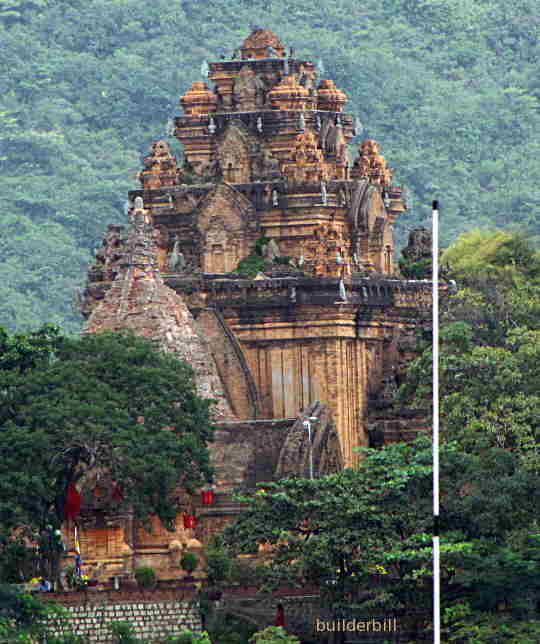 Cham towers Vietnam - In the touristy town of Nha Trang, a surprising little gem. Still in use after maybe 1100 years of change and warfare; the Po Ngar site. Cham towers Vietnam - This is the entrance to the main North tower showing the doorway with the script on either side carved into the reveals. 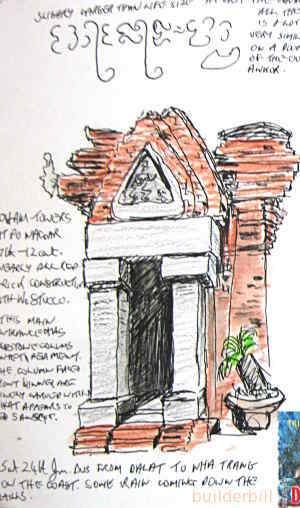 Cham towers Vietnam - The carved stone pediment over the entry door to the main North Tower. Dated about 1050 AD. On of the main reasons that I can spend many pleasurable hours wandering around sites like these when youngsters less than half my age are wilting under the hot sun and showing severe symptoms of being "templed out" is that with age I have learned to pace myself. There is almost always some shade and more often than not shade with a good view and somewhere to sit, so my technique is to sit down, relax for a while and absorb the atmosphere. And there usually is a lot of atmosphere in places like this despite being popular with locals and tourists alike. If the inclination takes me I even get the sketch book out and try a few lines. In classical architecture the decorated triangular sections high up on a building facade are known as pediments. 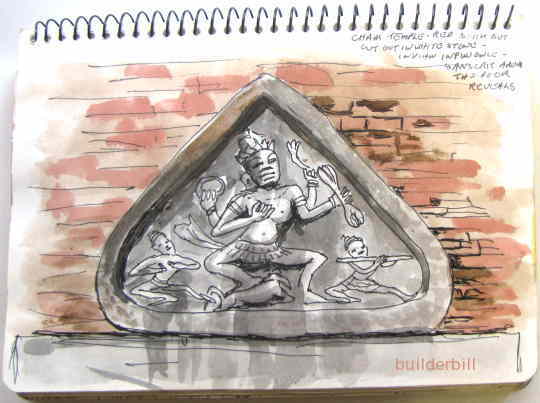 Now I don't know what the Hindu stone masons called them, but they certainly knew how to decorate them. The main structures of the towers are clay bricks and details like the doorway and pediment here are out of what looks like a type of sandstone. I liked the way that the water stains had really changed and accentuated the relief carving. I was fascinated with the Sanskrit and I tried to copy a few lines but I was blocking the entrance and so I kept it brief. At least here, unlike other places I was fairly sure that this attempt at copying the local script would not get an onlooker shaking his head at me and say in the local language the equivalent of "your making a right pigs ear outta that lad!" seeing as how there would'nt be too many people around today who can read it.